and through the entertainment and industrial heart of Cleveland Ohio. 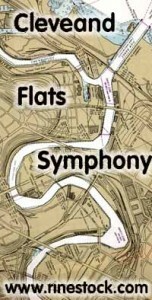 An area known as the Cleveland Flats. All is tranquil as we begin our voyage from the calm waters of Lake Erie towards the headwaters of the Cuyahoga River. At the river’s mouth, we pass Whiskey Island, only to be delayed by a lowered drawbridge. A train rumbles across. The bridge rises and like a curtain opening, the Flats entertainment district is revealed. We find ourselves immersed in a variety of sounds, symbolic of Cleveland’s cultural makeup. We pause to experience the Flats “Night Club Serenade”. Leaving the entertainment district and heading up collision bend, we traverse the indelibly crooked path of the river and are passed by a freighter that all but consumes the river channel. The first movement ends with a cry from the river, symbolic of the hard tolls and environmental abuses the Flats’ area has experienced. Around yet more river-bends, under more bridges and traveling on, we approach the heavily industrialized “steel district”. Both sides of the river are alive with activity as we pass through the heart of one of the world’s largest steel making complexes. Traveling further yet, the river wavers between industrial utility and unspoiled natural beauty. As we reach the river’s shallow limits, we reverse course. Winding back past everything we have just seen we return with increasing speed to the quiet waters of Lake Erie, from where it all began.